Jack Dale, whose art came from his history. Photographer Neil McLeod's professional entree into Aboriginal Australia was through Pastor Doug Nicholls, the first Aboriginal to be knighted and first to be appointed to vice-regal office (he served as Governor of South Australia in the 1970s). The suburb of Nicholls in Canberra is also named after him. At the time, Pastor Nicholls was seeking to engage both Aboriginal and white youth in re-awakening a sense of the culture and worth of Aboriginal people and society. 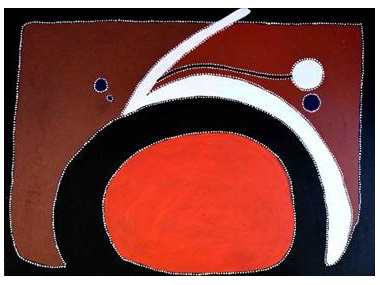 It was a call which resonated with Neil McLeod who has since devoted a large part of his professional life to recording Aboriginal art and culture. He first met Kimberley artist, Jack Dale (c 1922 - 2013) in the 1980's. 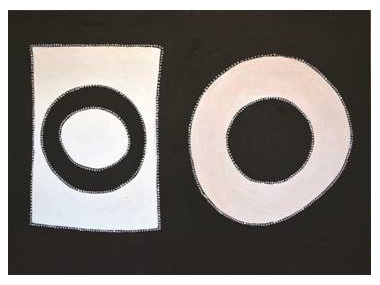 And from 2000 on, Jack Dale started painting exclusively for him, a collection can be seen in Neil McLeod's book, Jack Dale Mengenen. 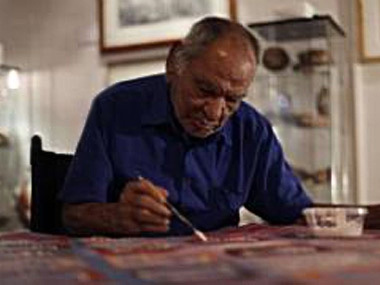 It is fascinating material because it was what Jack Dale had witnessed during his life which became the subject of his paintings; hiding in the bush watching chain gangs of Aboriginal men being marched away to the Prison Tree in Derby, nostalgic memories of his stockman days, the Wandjina dreaming sites of his people, and even the bombing of Roebuck Bay in WWII. It is thus in his artwork that we are able to see a hidden past. To find out more about Neil McLeod we suggest you read Adrian Newstead's book, The Dealer is the Devil. "When us old fellas pass away our history and stories will be in my paintings."